FAIL TO prepare and prepare to fail! Words that every footballer should take note of and a principle that DB Sports Tours is based upon. In hindsight, those famous words from former Ireland and Manchester United captain Roy Keane practically announced the dawn of a new era in modern football. 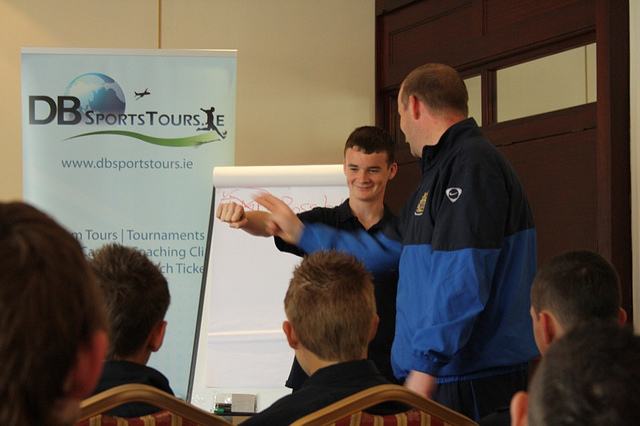 Nutrition, recovery, tactics and psychology are essential aspects of the game now – not just for professionals but even at schoolboy level in Ireland. Names like Jose Mourinho and Pep Guardiola are now as famous, if not more, than the superstar players they manage because they give their sides a vital off-field advantage with their cutting-edge expertise. What was once regarded a continental culture – the art of preparation – is now simply part of the modern game at every level and that is why we at DB Sports Tours strive to provide the best for our customers. Today’s young aspiring players and coaches want to be introduced to everything Europe’s top professional clubs have to offer – from training facilities, coaching staff and cutting edge concepts – and we provide it. In 2011 we took the North Dublin Schoolboy League representative side to Manchester in advance of their Kennedy Cup campaign that summer. The short version of the story is that they beat Manchester United’s Under-12s 1-0 in their own backyard before sending shockwaves through Irish football not long after with their tournament win in Limerick. If you truly believe, like we do, that the devil is very much in the detail than the longer version of this incredible story is significant. One of a host of talented individuals we introduced the Dublin league’s top players to during that trip across the water was Simon Cooper – the Head of Youth Recruitment at Accrington Stanley and a coach at Manchester City’s academy. In particular, Cooper is an advocate of the benefits psychology and visualization can bring to performance on the football pitch. His coaching academy Eternal Football showcases all his groundbreaking ideas on development and www.eternal-football.co.uk is a must-visit website for any real students of the game. We organized for Cooper to give a brief lecture/visualization session with the NDSL players before their clash with United and whether or not you believe it directly affected the result you should check it out in the LINKS BELOW. When we caught up with Simon recently on a trip to Manchester we sat down and revisited the subject of his lecture and the amazing effect it had on those young Irish players. “The whole point of psychology is to improve mental performance of course – so the most important thing is to show players how mental performance can actually work,” he admits. “So what I basically did is ask them if there was something they could do to improve their performance would they want to know more about it and of course they all said yes. “Than it is about giving them physical examples that what we are talking about really does work (as you can see in the clips). “In that short space of time that I had to work with the squad the most important thing I was working on was visualization. “For example, when I take an Accrington Stanley team to play Manchester United I tell the players to take the jersey off their opponents in their mind and they become just normal players like them. “Because, the reality is most of the United players that play our younger teams will not go on to get professional contracts and will eventually play at a lower level than our lads eventually so it essentially is just a normal game and they have to look at it like that. “When you bring Irish players over to face Manchester United the biggest thing is that they really want to prove that they can match United’s eleven. “So that is the positive and you want to build on that positive and use it to your advantage.